Selected the BEST OF SHOW Award from the attendees for the 2017 Art Providence/RISD Holiday Show in Providence Rhode Island this December. Selected BEST OF SHOW by Attendees for the Art Providence/RISD Holiday Show 2017! Art Providence/RISD Photo of Booth. 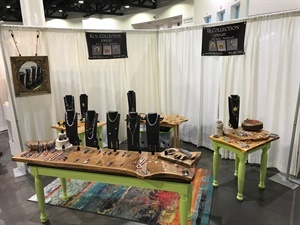 I displayed my Metalsmithing and Beadwork in an open format using all Live Edge Tables. The organic displays worked perfectly with my organic and floral designs I use throughout my work. Thanking Art Providence/RISD again for this honor of BEST OF SHOW by Attendees!